Summary: On September 5, a little after midnight, Death-Cast calls Mateo Torrez and Rufus Emeterio to give them some bad news: They're going to die today. Mateo and Rufus are total strangers, but, for different reasons, they're both looking to make a new friend on their End Day. The good news: There's an app for that. It's called the Last Friend, and through it, Rufus and Mateo are about to meet up for one last great adventure and to live a lifetime in a single day. Guys, This book was honestly the cutest thing ever. Adam Silvera did an amazing job taking something heartbreaking and turning it into something uplifting. Like it says in the summary, Mateo and Rufus receive a call from Death-Cast, informing them that they are going to die sometime in the next 24 hours. After Mateo and Rufus get their calls, they decide to live their last day to the fullest. 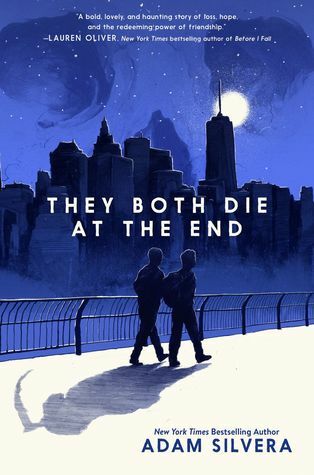 They both download the Last Friend app, an app that allows other Deckers (the people who got their call) to find someone to spend their last hours with,the two boys meet each other. Together, they spend the day doing adventurous things, saying goodbye, and just living their last day to the fullest. They learn to live and, most importantly, love in the short time they had together. I loved the fact that Silvera combined a contemporary novel with a touch of scifi. I haven't read anything like that in a while. The whole concept of getting a call the day your going to die really freaks me out. Like why would anyone want to know when they're going to die?! Naturally, by the end of the book, I was sobbing like a little baby. The way they both died was totally unfair ( but so is dying in general so..). It's also upsetting because even though you know it's going to happen (the title literally gives away the ending) the emotions still get to you. This book gives such an excellent message of the power of togetherness and how much we truly need someone. This is a total must read for anyone and everyone. Make sure to let us know your opinions once it comes out! I'm insanely excited for this one! I've heard such amazing thing about Adam Silvera in general and I can't wait to dive into his writing. I'M READY FOR DA FEELS.